If it were just food and fiber, it would be indispensable. But agriculture is more than that. It’s both the promise of sustenance for a hungry world and a source of enjoyment in a demanding world. It is education and entertainment. It is land use and landscape. It is natural sustainability and national security. It is a confluence of biology, chemistry, physics, genetics, engineering, meteorology, biotechnology, economics, finance, marketing, packaging, distribution, sales, and sociology. Essentially, agriculture is life. For 60 years, the College of Agriculture at California State University, Chico has impacted the quality of life in California and across the nation by educating and equipping agricultural leaders who have the theoretical knowledge, practical experience, and decision-making ability that allows them to excel in their chosen career. The close, friendly nature of our college, combined with an integrated agricultural curriculum and remarkable access to hands-on education, creates a fertile learning environment for our students and the agriculture industry we serve. 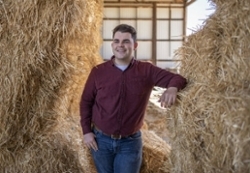 The quote that senior Matt Bongiovanni often shares with students has shaped the guiding principles of the agricultural education major’s life and driven him to grow through all of his experiences. Since coming to California State University, Chico as a freshman, his passion for agricultural education has been unwavering, but new experiences and interests have expanded the career possibilities in his foreseeable future.